Bonita, Bonnie to those closest to her, loved her family and friends dearly, and they loved her in return. 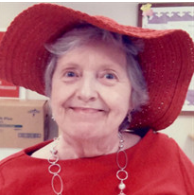 Throughout her life she was known for her strong spirit, deep faith, and vivacious personality. Bonnie lived in Ohio her first few years of life and then her parents moved the family to Maryland where she attended school and met her first husband, Lewis. They had two children, Lori and Jason. When Bonnie walked into a room, her beauty, charisma, and fun-loving personality was evident to all. Holiday dinners and summer picnics with her family, especially her siblings, were always filled with lots of laughter and joy. She had quite a sense of humor and her “I Love Lucy” style escapades with best friend, Ann, were legendary. She had a deep love of music and dancing, and in her younger years could always be found dancing around the house with a feather duster and vacuum cleaner. She enjoyed sewing clothes for herself and her daughter, Lori, and even sewed the white silk gown that Lori wore for her high school graduation. Bonnie was a great cook and baker, and loved to make her son, Jason, chocolate chip and pecan sandy cookies at Christmas. She surprised everyone, even herself, with her talent when she decided to take up oil painting. Earlier in her life she worked as a financial secretary before staying home to raise her two children. In later years she helped her second husband, Tom, oversee their excavating business before his death in 1991. As the years passed, she became a grandmother to five grandsons. This brought her great joy, and she was so proud of each one. She liked to point to each grandson and proclaim an aspect of their personality that she found endearing. After suffering a stroke in 2003, she was able to live on her own until the decision to move to a nursing home became necessary. She was a close and dear friend to several women in the nursing home and would tell her family stories about each one. She especially loved Shirley. Bonnie’s strong spirit and deep faith helped her pull through many health issues in her life. This time the Lord called her home. Her family and friends are deeply saddened that she has left this life but rejoice in the fact that she has shed her struggles like a beautiful butterfly and has flown away to a life of joy and peace in the loving arms of Jesus. A celebration of her life will be held on Sunday January 20, 2019 beginning at 4:00 PM at Canoe Creek Christian Church. Interment will take place at Florida National Cemetery in Bushnell, Florida on January 22, 2019 at 11:00 AM. Arrangements are under the care of Osceola Memory Gardens Cemetery, Funeral Home and Crematory, 2000 13th Street, St. Cloud, FL 34769. 407.957.2511.www.osceolamemgds.com. Want to get notified whenever we write about Osceola Memory Gardens Cemetery Funeral Homes & Crematory ? Sign-up Next time we write about Osceola Memory Gardens Cemetery Funeral Homes & Crematory, we'll email you a link to the story. You may edit your settings or unsubscribe at any time.